Remove the dove breasts from the bone and set aside. In a saucepan, add the red wine, barbecue sauce and teriyaki sauce and whisk together. Let simmer for 10 minutes and remove form the heat. Let cool until warm but not hot. Transfer the marinade to a bowl and submerge the dove breasts into the liquid and let soak for at least 1 hour but up to 4 hours. 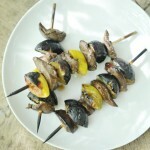 Slice the figs in half and skewer the dove breasts and fresh figs, alternating them on the skewer.